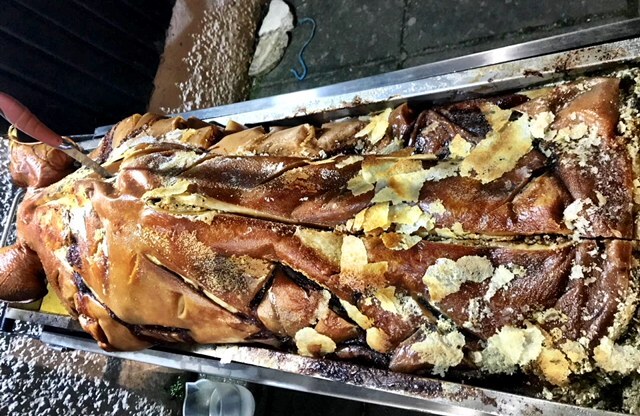 Recently, the Hog Roast Fife team cooked a fantastic hog roast for a newly wedded couple in Scotland. Mr and Mrs Steven had their wedding in St Andrews and wanted a Hog Roast buffet to serve to their guests in the evening. 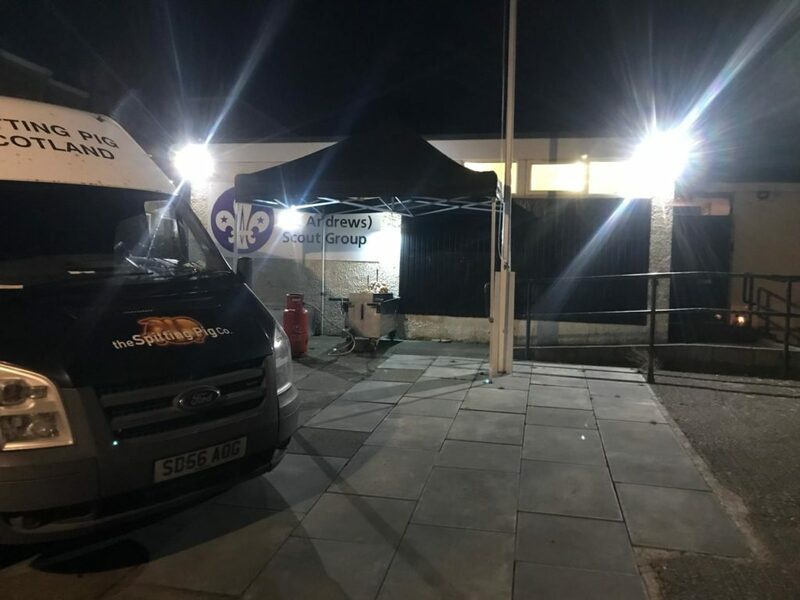 The celebration was held at a local scouts hall called ‘26 E Scores’ and the team cooked the food onsite outside of the venue and served the buffet along tables inside the scouts hall. The Hog Roast team is a fantastic choice for any wedding party, either for the daytime catering with a three course meal or an evening buffet, as they can provide a diverse selection of food of the best quality to create the most amazing wedding. The couple chose Menu Four from the Hog Roast Fife team’s menu selection which included a large slow roasted hog served with apple sauce, crackling and homemade stuffing. In addition, the couple chose Texan 24 hour beef brisket as a second main meat. In addition, vegetable skewers were served as a vegetarian option to the main meats. Alongside the meats, the Hog Roast team served a tomato and mozzarella salad, a career salad, Thai salad and also a tray of new potatoes. The guests appeared to really enjoy the food and the team ensured that everything was cooked to perfection for the wedding guests. In addition, as the food was cooked outside, the team had to ensure that it all remained warm and the meat was cooked through. The couple requested for the buffet to be served at 5:30pm and the Hog Roast Fife team ensured that they met this deadline, especially as weddings run to such strict schedules. The service was led by the team’s Head Chefs John and Steven who did a fantastic job of bringing the buffet together. In addition, they ensured that the meat remained warm without being dried out and overcooked and the side dishes were also cooked perfectly. They also lightly charred to vegetable skewers to bring the great flavours of roasted vegetables together. The party had a great atmosphere and everyone had a great time celebrating at the wedding. The couple had a beautiful evening and the celebrations were the best way to begin their hopefully long and happy marriage together. Hog Roast Kingsbarns For 40th Wedding Anniversary Party!